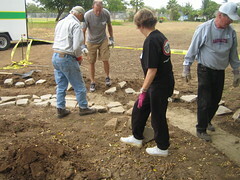 On May 14 -- the "350 Garden Challenge" weekend -- we made great strides in our community garden installation. The garden site in my local neighborhood in Los Angeles is nearly an acre in size. 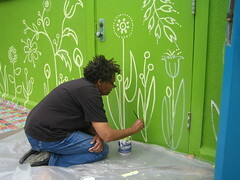 The plan combines a traditional plot-style community garden with a school garden and aspects of a community park. The land is owned by the massive LA Unified School District. More than a decade ago this land was the site of an active "ag" program complete with vegetable plots and a greenhouse. Some middle-aged community members who attended the school have offered stories and memories of the times when it was a garden. The site has been vacant now for more than 11 years (I've lived in the neighborhood 11 years and it's been weeds all along). Two years ago we began working the political aspects of creating a garden -- trying to convince the school district. Last November, with a change in administrators, the floodgates opened up, and we broke ground on January 17. We're doing it with no budget. We don't have a checking account yet, and we're still in-progress in setting up the 501c3. We're doing the entire project by getting in-kind donations, like the local Revitalization committee who bought fruit trees from a local farmers market vendor and donated them to the project, or our local nurseryman who has been very, very generous. This project has meant working with some massive public agencies. Through a very helpful LAUSD Ombudsman, the school district is installing a few aspects of the plan, and the mayor's office has joined on to help find resources within the city. We're now working with LA Department of Water and Power to arrange for the water lines. The bulk of the project is being installed via a series of community work days, one per month. We scheduled the groundbreaking workday for Martin Luther King Day of Service. Another work day aligned with Earth Day. 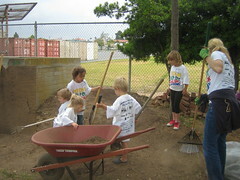 The most recent work day aligned with an annual city-wide community service day here in L.A. called "Big Sunday weekend," which coincidentally aligned with the 350.org and Transition U.S. garden challenge. On May 14 we had 105+ volunteers. People came from our local Transition group, from the school (students, parents, staff, teachers), from the Big Sunday organization, from local church groups, and more. 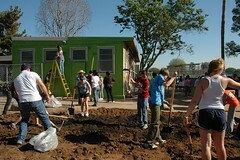 Often a local university sends teams of volunteers out to do community service. 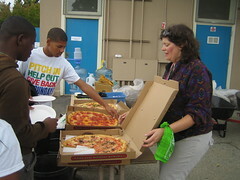 That Saturday, the delicious food came from the local pizza place, a small local business whose owners know us well. On May 14 we "harvested" existing urbanite (broken concrete) from the site and built a spiral walkway for what we have begun calling the "butterfly garden" -- a small section with native plants and beneficial-insect-attractant flowers. We sand-set the urbanite chunks into sand which had already been on the site. In many ways we are reusing existing materials rather than hauling stuff away and hauling in "new" stuff. We planted 3 additional fruit trees, and a teen guided teams in taking care of the trees we had planted at previous workdays. The trees got new support stakes, new water basins, weed-free surroundings, and fresh mulch. We weeded and mulched a good portion of the student garden area. Despite severe budget cuts, pressure to "teach to the test," and lack of garden-knowledgeable adults at the school, we're making change: student classes are beginning to garden once again. The parent-teacher organization, once skeptical, is now enthusiastic. The principal is thrilled at so much community involvement the school. Teachers look forward to a nature garden and to having an outdoor classroom site. Our plans include a large circular seating area that will be built via earth-bag or cob construction from on-site materials. We plan to hold a public workshop to teach these skills, even as we build the feature for the school. The native plants for the "butterfly garden" will be coming from a Cal State university. 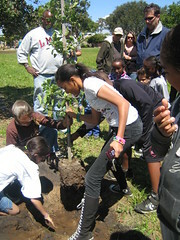 A few at a time, a grove of fruit trees are being planted, even as we round up donations toward the (yikes, expensive!) irrigation system. The final plan will include a long walking path around the garden, with perimeter plants labeled to create a "botanic garden of edible plants." Already we are hearing from people who want to get one of the 38 precious community garden plots. We're having to figure out how to design a lottery for the places. As we form the structure for the garden organization, we are defining such terms as using organic techniques, volunteer hours for the common good, and growing a high percentage of food. The May 14 garden challenge organized by Transition US was an interesting focus project, but from our team's point of view that single day was only one in the midst of a long-term, multi-year commitment to seeing this garden become a reality.